ACalories (= 4.18 Joule) to raise 1 gram by 1°C. Modified from Hadas, 1979.
with freestanding, or gravitational, water at saturation, the system is essentially subaquatic (Fig. 1.1). With subsequent evaporation and plant transpirational water losses from the soil, the freestanding water disappears, leaving some capillary-bound water (Fig. 1.2), which has been termed the edaphic system. Further evaporation then occurs, resulting in the virtual absence of any capillary water, leaving only the adsorbed water at a very high negative water tension (Fig. 1.3). The implications of this complex three-dimensional milieu are of fundamental importance for a very diverse biota. Vannier (1973) proposed the term "porosphere" for this intricate arrangement of sand, silt, clay, and organic matter. Primitive invertebrates first successfully undertook the exploitation of aerial conditions at the beginning of the Paleozoic era (Vannier, 1987). This transition probably took place via the soil medium, which provided the necessary gradient between the fully aquatic and aerial milieus. This water-saturated environment, so necessary for such primitive, wingless (Apterygote) forms as the Collembola, or springtails (Fig. 1.1), is equally important for the transient life-forms such as the larval forms of many flying insects, including Diptera and Coleoptera. In addition, many of the micro- and mesofauna, (described in Chapter 4,) could be considered part of the "terrestrial nannoplankton" (Stout, 1963). Stout included all of the water-film inhabitants, namely: bacteria and yeasts, protozoa, rotifers, nematodes, copepods, and enchy-traeids (the small oligochaetes also called potworms). Raoul France, a German sociologist, made analogies between aquatic plankton and the small and medium-sized organisms that inhabit the water films and water-filled pores in soils, terming them: "Das Edaphon" (France, 1921). FIGURE 1.1. Diagram of gravitational moisture (the subaquatic system) in the soil framework (from Vannier, 1987). pF = -log cm H2O suction; R.H. = relative humidity; 2.5pF = field capacity. FIGURE 1.2. Diagram of capillary moisture (the edaphic system) in the soil framework (from Vannier, 1987). 4.7pF = -5mPa; 2.5pF = -0.03mPa = field capacity. FIGURE 1.3. Diagram of adsorptional moisture (the aerial system) in the soil framework (from Vannier, 1987). 7pF = -1000mPa; 4.7pF = -5mPa; permanent wilting point = -1.5 mPa = 4.18 pF. 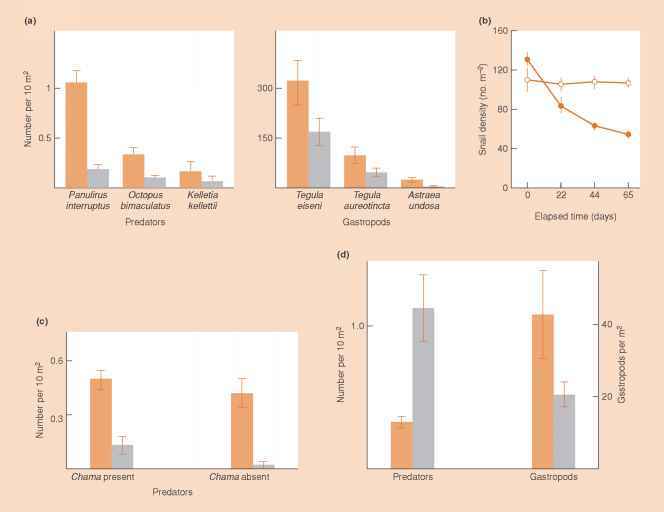 As noted in Figures 1.1 to 1.3, there is a marked difference in moisture requirements of some of the soil microarthropods. Thus another major group, the Acari, or mites, are often able to tolerate considerably more desiccation than the more sensitive Collembola. In both cases, the microarthropods make a gradual exit from the soil matrix as the desiccation sequence described above continues. Other organisms, more dependent on the existence of free water or water films, include the protozoa and nematoda, the life histories and feeding characteristics of which are covered in Chapter 4. In a sense, the very small fauna, and the bacteria they feed upon, exist in a qualitatively different world from the other fauna, or from fungi. Both larger fauna and fungi move into and out of various water films and through various pores, which are less than 100% saturated with water vapor, with comparative ease (Hattori, 1994). In conclusion, this overview of soil physical characteristics and their biological consequences notes the following: "For a physicist, porous bodies are solids with an internal surface that endows them with a remarkable set of hygroscopic properties. For example, a clay such as bentonite has an internal surface in excess of 800m2g-', and a clay soil containing 72% montmorillonite possesses an internal surface equal to 579 m2g-1. The capacity to condense gases on free walls of capillary spaces (the phenomenon of adsorption) permits porous bodies to reconstitute water reserves from atmospheric water vapor" (Vannier, 1987). Later, we will address the phenomenon of adsorption in other contexts, ones that are equally important for soil function as we know it. FIGURE 1.4. 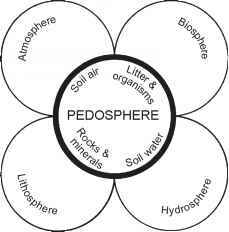 The pedosphere, showing interactions of abiotic and biotic entities in the soil matrix (from FitzPatrick, 1984).